Some AWS services create and manage AWS resources on your behalf. To do this, these services require you to delegate permissions to them by using AWS Identity and Access Management (IAM) roles. Today, AWS IAM introduces service-linked roles, which give you an easier and more secure way to delegate permissions to AWS services. To start, you can use service-linked roles with Amazon Lex, a service that enables you to build conversational interfaces in any application by using voice and text. Over time, more AWS services will use service-linked roles as a way for you to delegate permissions to them to create and manage AWS resources on your behalf. In this blog post, I walk through the details of service-linked roles and show how to use them. Each service-linked role links to an AWS service, which is called the linked service. Service-linked roles provide a secure way to delegate permissions to AWS services because only the linked service can assume a service-linked role. Additionally, AWS automatically defines and sets the permissions of service-linked roles, depending on the actions that the linked service performs on your behalf. This makes it easier for you to manage the permissions you delegate to AWS services. AWS allows only those changes to service-linked roles that do not remove the permissions required by the linked service to manage your resources, preventing you from making any changes that would leave your AWS resources in an inconsistent state. Service-linked roles also help you meet your monitoring and auditing requirements because all actions performed on your behalf by an AWS service using a service-linked role appear in your AWS CloudTrail logs. When you work with an AWS service that uses service-linked roles, the service automatically creates a service-linked role for you. After that, whenever the service must act on your behalf to manage your resources, it assumes the service-linked role. You can view the details of the service-linked roles in your account by using the IAM console, IAM APIs, or the AWS CLI. Service-linked roles follow a specific naming convention that includes a mandatory prefix that is defined by AWS and an optional suffix defined by you. The examples in the following table show how the role names of service-linked roles may appear. If you are the administrator of your account and you do not want to grant permissions to other users to create roles or delegate permissions to AWS services, you can create service-linked roles for users in your account by using the IAM console, IAM APIs, or the AWS CLI. For more information about how to create service-linked roles through IAM, see the IAM documentation about creating a role to delegate permissions to an AWS service. To create a service-linked role or to enable an AWS service to create one on your behalf, you must have permission for the iam:CreateServiceLinkedRole action. The following IAM policy grants the permission to create service-linked roles for Amazon Lex. The preceding policy allows the iam:CreateServiceLinkedRole action when the linked service is Amazon Lex, and the name of the service-linked role starts with AWSServiceRoleForLex. For more information, see Working with Policies. If you no longer wish to use a specific AWS service, you can revoke permissions for that service by deleting the service-linked role. You can do this from the linked service, and the service might require you to delete the resources that depend on the service-linked role. This helps ensure that you do not inadvertently delete a role that is required for your AWS resources to function properly. To learn more about how to delete a service-linked role, see the linked service’s documentation. Just like existing IAM roles, the permissions of service-linked roles come from two policies: a permission policy and a trust policy. The permission policy determines what the role can and cannot do, and the trust policy defines who can assume the role. AWS automatically sets the permission and trust policies of service-linked roles. For the permission policy, service-linked roles use an AWS managed policy. This means that when a service adds a new feature, AWS automatically updates the managed policy to enable the new functionality without requiring you to change the policy. In most cases, you do not have to update the permission policy of a service-linked role. However, some services may require you to add specific permissions to the role such as access to a specific Amazon S3 bucket. To learn more about how to add permissions if a service requires specific permissions, see the linked service’s documentation. Only the linked AWS service can assume a service-linked role, which is why you cannot modify the trust policy of a service-linked role. You can allow your users to create service-linked roles for AWS services while not permitting them to escalate their own privileges. For example, imagine Alice is a developer on your team and she wants to delegate permissions to Amazon Lex. When Alice creates a service-linked role for Amazon Lex, AWS automatically attaches the permission and trust policies. The permission policy includes only the permissions that Amazon Lex needs to manage your resources (this best practice is known as least privilege), and the trust policy defines Amazon Lex as the trusted entity. As a result, Alice is able to create a service-linked role to delegate permissions to Amazon Lex. However, she is unable to edit the trust policy to include additional trusted entities. This prevents her from granting unapproved access to other users or escalating her own privileges, while still having the necessary permissions to create service-linked roles for Amazon Lex. The following steps lead you through creating a service-linked role by using the IAM console. However, before you create a service-linked role, make sure you have the right permissions to do so. 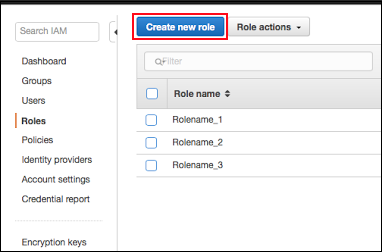 On the Select role type page, in the AWS service-linked role section, choose the AWS service for which you want to create the role. For this example, I choose Amazon Lex – Bots. Notice that the role name prefix is automatically populated. Type the role name suffix for the service-linked role. Some AWS services, such as Amazon Lex, do not support custom suffixes, in which case you should leave the role name suffix box blank. Include a description of the new role. Notice that IAM automatically suggests a description for this role, which you can edit. For this example, I keep the suggested description. Choose Create role. After the role is created, you can view it in the IAM console. Service-linked roles are marked with a cube-shaped icon in the console to help you distinguish these roles from other roles in your account. With service-linked roles, delegating permissions to AWS services is easier because when you work with an AWS service that uses these roles, the service creates the role for you. You do not have to create IAM policies for delegating permissions to AWS services. Any changes to these roles that might interfere with your AWS resources do not go through. Delegation of permissions is secure because only the linked service is able to use these roles. To see which AWS services support service-linked roles, see AWS services that work with IAM. If you have any comments about service-linked roles, submit a comment in the “Comments” section below. If you have questions about working with service-linked roles, please start a new thread on the IAM forum.